The difference between a properly-groomed beard and one that’s not usually is pretty obvious. Unless you’re going for an ungroomed look you need to trim your beard consistently, as well as obtain the tools to help you do the job properly. We’ll show why in this review of the best beard and mustache scissors, including the Sanguine Professional Mustache Beard Trimmers our top pick. We’ll also discuss how to use beard and mustache scissors and compare scissors to beard trimmers, including the advantages and disadvantages of each. But let’s begin by examining some scissors buying tips. Beard scissors, mustache scissors & beard trimmers: which one is best? There are many reasons why it’s important to use beard and mustache scissors, not regular scissors, to trim your facial hair, reasons which we’ll get into later. Their importance to the proper grooming and maintenance of your beard and mustache cannot be understated, and the following tips will help you to choose wisely. 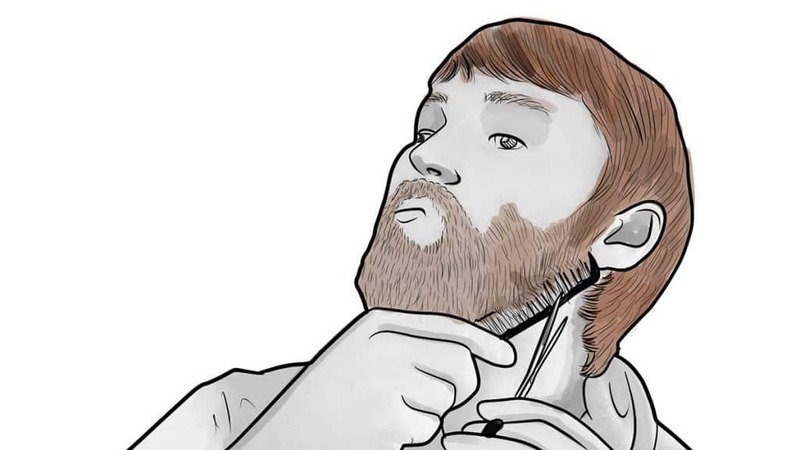 Most trimming scissors today come in one length, but there are longer options available in case you want to try them on a bushier beard. Back in the day, when there was a wide variety of scissors for use, specifically, on a beard or mustache, beard scissors had longer blades than those on mustache scissors. The shorter blades, in theory, made it easier to handle the finer “detail” work of mustache trimming. 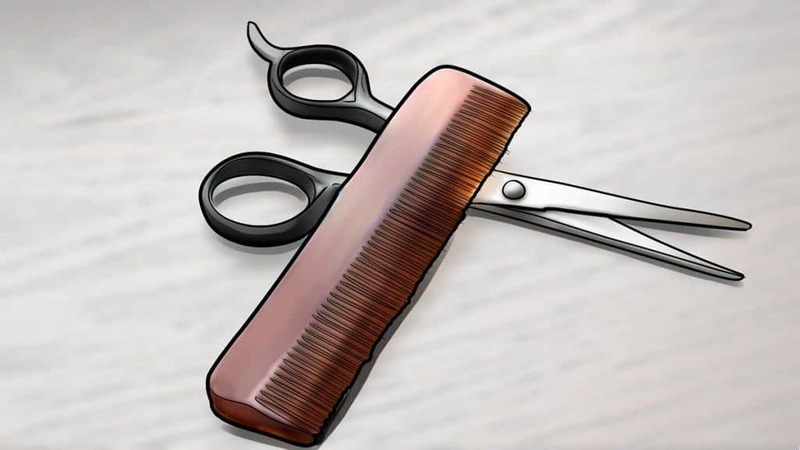 Professional barbers and hairdressers generally use scissors that measure from 5.5.-inches to 7 inches. 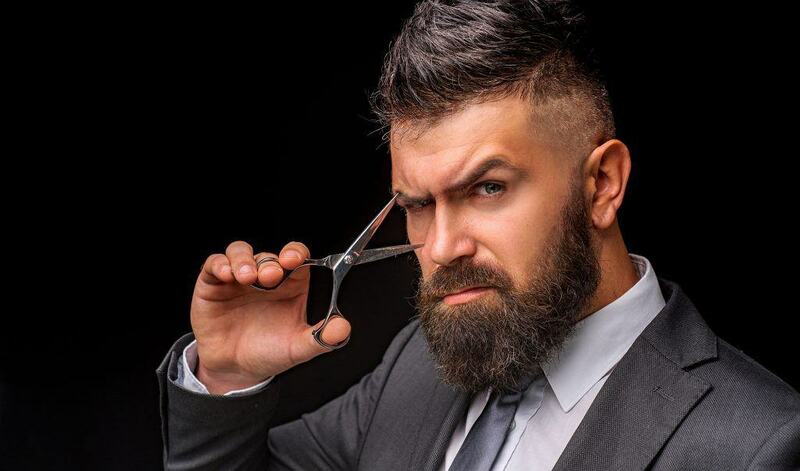 For the rest of us, however, a 7-inch scissor isn’t practical, so scissors in the 5 to 5.5-inch range can adequately handle even the bushiest beard. You can even go as short as four inches, especially if you use them as travel scissors and need increased portability. Japanese steel offers a curved cutting edge and it’s considered more “delicate” than German steel. Not that it’s going to break easily, mind you, but it’s more refined and sometimes becomes dull faster than German steel, which means you may have to sharpen it from time to time. German steel has a beveled cutting edge that provides a firm “grip” on your beard and mustache hair. It doesn’t dull as quickly as Japanese steel, but you’ll know that they’re dull when you feel them tugging at your whiskers rather than cutting them cleanly. Japanese stainless steel has the (well-deserved) reputation of being one of the more precise cutting materials on the market. German steel consists of thicker plates. You can’t go wrong with either type of steel, but the minor differences between the two may influence your buying decision. While it’s still a righthander’s world in many ways, things are changing in a way that helps lefties feel less on the periphery of things. That said, most beard and mustache scissors are made for righties. For many lefthanded men, who learned to adapt to the righthanded world long ago, that’s not a big deal. Nonetheless, you can find scissors made for lefties if you aren’t comfortable with a pair made for righties. The grips of your scissors are important for a lot of reasons, not the least of which is keeping your hand steady while trimming your facial hair. They also help determine the overall comfort of the process. So, look for grips with large enough openings that don’t squeeze your fingers, no matter the size of your hands. Many facial hair scissors also come with finger rests (which are bars on the bottom ring of your scissors that pop out from it). Some scissors come with removable finger rests. The tension screw is a circular knob at the place that holds the blades of the scissors together. It allows you to change the tension of your shears by bringing the blades closer together. It does not, however, alter your blades’ sharpness, as some people believe. You should never underestimate the potential danger of the sharp tips of your scissors’ blades, and some come with safety tips that help to protect the skin under your whiskers. Let’s take a look now at the best beard and mustache scissors for 2019. The complete title of Sanguine’s mustache and beard scissors includes the description “extremely sharp,” at least on Amazon. And, yes, they are very sharp scissors that give you a precise cut with every use, whether you’re trimming your beard or ‘stache. Sanguine’s Japanese steel scissors are compact and work well for trimming your eyebrows, as well. While the scissors are smaller overall than many others, they have large, comfortable finger openings. They’re also suitable for left-handed and right-handed men. Simply put, they’re easily among the best beard scissors available today. We’ve already briefly mentioned their versatility: you can also use them on your eyebrows and use them with either hand. The sharp blades mean that you can get a close, precise trim with less effort. Be careful when using them for the first time – or first few times – to avoid cutting yourself. You can tighten or loosen the blades with the built-in tension screw. You can take them apart easily for oiling and cleaning. They’re size make them ideal of travel. The comfortable grip is ergonomic and helps to make trimming your facial hair effortless. The ability to use them with either hand makes it easier to trim both sides of your face and to get into tight spots. 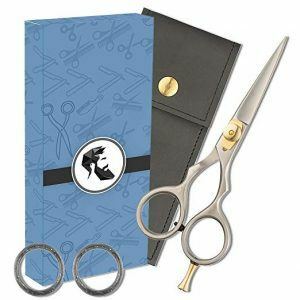 The scissors come with an elegant leather carrying case with a magnet closure. Sharp, comfortable, and versatile – Sanguine’s beard and mustache scissors provide everything you need to get a close trim. They’re also durable and built to last. Tweezerman has a cool name, a loyal fan base, and a long list of quality products to back up their stellar reputation. And when it comes to the best mustache scissors, look no further than their G.E.A.R. Scissors With Comb. While they’re suitable for overall thinning and trimming, the G.E.A.R. scissors work particularly well for detail work thanks to sharp, straight blades that have micro-serrations to keep hair from slipping. Their stainless steel blades are also very durable. You’ll also like their ergonomic design, which includes large finger loops that won’t constrict your fingers while also providing superior control. In other words, they’re very comfortable to use and comfort goes a long way in helping users get the kind of precise cut they need. The grip is large enough for even the beefiest man hands. On the other hand, the overall size of the scissors is small, the grips notwithstanding, which makes them ideal for people who don’t have large, thick mustaches or beards. But you can also use them to trim your nose and eyebrow hair. But, again, it’s hard to beat the G.E.A.R. scissors for handling detail work. We like the sharpness of the blades – a sharpness that goes all the way to the tips – and that they don’t pull or tug at your hair while you trim. Their stainless steel will rarely, if ever, need sharpening. The scissors also come with a comb. While some reviewers say that the comb isn’t of the highest quality, it’s handy to have around while your trimming and styling your ‘stache and beard. If you’re looking for a pair of mustache and beard scissors that can handle the most precise detail work, the G.E.A.R. scissors by Tweezerman are for you. They’re also versatile enough to trim your nose and eyebrow hair. While there’s nothing wrong with using beard and mustache trimmers, there’s also nothing quite like a quality pair of scissors when it comes to precision. 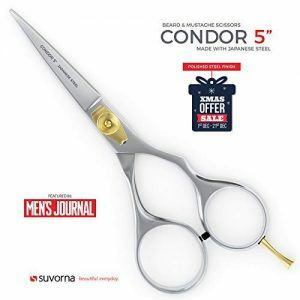 The Suvorna Men’s Beard & Mustache Scissors are just such a pair and make it easier to get rid of stray or unruly hair. They’re built to last and come with a lifetime warranty, as well as a 60-day free return policy. If you don’t like them, you can send them back for a refund or exchange with no questions asked. The Japanese stainless steel blades have extremely sharp convex edges and are tightly-fitted. The finger holes are large enough that men with bigger hands can use them comfortably. They also have a removable ring finger rest, which always is handy. The folks at Suvorna mirror-polish the stainless steel to create a highly-reflective, smooth surface that’s resistant to moisture and oxidation. Suvorna’s beard and mustache trimmer is suitable for thin, thick, and heavy whiskers, but especially on coarse hair that’s thicker than most. The blades’ sharp edges allow you to get a clean, smooth cut every time. The adjustment screw enables users to make fine tension adjustments. The scissors come with a comb and an attractive storage pouch that’s small enough for travel purposes. Suvorna’s scissors get the job done whether it’s precise cutting or thinning out thicker beards and mustaches. They’re also great for trimming sideburn hair. There’s a reason, or reasons, why Utopia Care’s Curved and Rounded Facial Hair Scissors are Amazon’s best-selling mustache scissors. Considering that they come at a more-than-fair price, they’re also a bargain. Many elements go into making these scissors a top seller, not the least which are sharp cutting edges with rounded and curved tips. You can count on cutting accuracy while also being able to trim areas such as nose hair and ear hair, as well as your eyebrows. 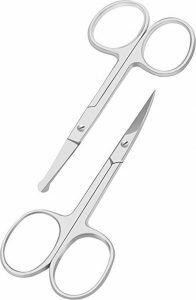 The stainless steel used to make these scissors is surgical grade and won’t rust or stain, while also lasting longer than blades made from ordinary steel. The blades’ rounded, curved tips also prevent accidental nicks and cuts that can sometimes happen to even the most steady-handed man. You won’t find a lot of blades with this feature, which helps these scissors stand out in a crowd. Further comfort comes from an ergonomically-designed handle and grip. They’re easy to use, and small enough that you can easily carry them with you when you travel. While the stainless steel used to make these scissors is durable, you’ll help increase their longevity by wiping them with a dry, delicate cloth after each (and also storing them in their closed position). Many users swear by Utopia Care’s Curved & Rounded scissors and it’s hard to blame them. They’ll give you a clean, accurate trim for years to come. These aren’t the only beard and mustache scissors made by BuzzBarber but, according to them, they’re the best of the lot. They’re certainly deserving of a mention in our beard scissors reviews and a product bearded and mustachioed men should give serious consideration. The blades, made of Japanese steel as the name suggests, have superior sharpness and easily trim every area of the beard, top to bottom. They also won’t pull and tug at your facial hair while you’re trimming. They’re a favorite of many barbers and other professional stylists. They’re easily adjustable thanks to a tension screw you can fine-tune with your fingers. The screw also includes a leaf spring to help you make micro adjustments. The steel is high grade, heavy duty, and built to last. The fingers holes, while small, are ergonomic and perfectly aligned. The scissors also come with a finger rest, and also feature silicone rings and a bumper silencer. They’re versatile enough to use on your bangs, eyebrows, sideburns, etc. They also come with a leather pouch that makes them very portable. Professional barbers love them because they work well with a variety of cutting techniques. 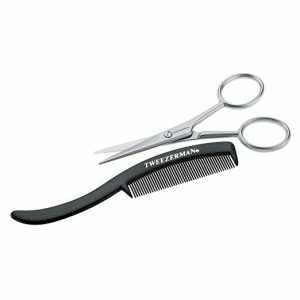 BuzzBarber’s scissors are a favorite of professionals but also suitable for do-it-yourselfers who trim their whiskers in the comfort of their bathroom. From their quality steel to the ability to make adjustments easily, there’s a lot to like about these scissors. Regularly trimming your beard and mustache has many benefits, including that it prevents dirt, bacteria and clogged pore. You should always begin the trimming process with a clean beard and mustache, however, which means washing it beforehand, usually in the shower, with a quality beard/mustache shampoo or wash.
You don’t need to use a large amount of beard wash or shampoo and you should cleanse your whiskers with the same mindset as you use to wash your hair, i.e., you want to scrub deeply also to clean the skin underneath. Use the tips of your fingers to scrub with the shampoo while making sure to move the hair in different directions. Wash and rinse your whiskers with warm water (but not too hot) because warmer water helps to open the skin’s pores beneath your beard and mustache. Water that’s too hot will cause your skin to become too dry. Rinse your beard and mustache thoroughly until no beard wash or shampoo residue remains. Note: You can place a towel soaked in warm water on your face for 10 minutes if you don’t want to wash your beard or mustache in the shower or at the sink. The towel opens up your skin’s pores and removes the top layer of dirt and debris. Washing your whiskers in the shower with a beard wash provides a more thorough cleaning, however. Dry your beard and mustache completely before you begin trimming; if you trim a wet beard, the chances are good that it’s going to look different when it dries because you may have chopped off too much hair. Scissors work best on beards that have grown greater than an inch. Use a similar approach to trimming your mustache while always making sure to keep your mouth free of whiskers, unless you’re choosing a particular style in which the hair runs over the upper lip. In most cases, however, you’ll need to trim your mustache and beard about once a week, although you may want to do it more often if you’re trying to achieve a certain look. After all, there’s no shortage of beard and mustache styles. 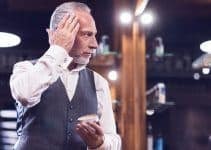 We’ve already talked at length about your most important tool for this process – your scissors – but you should also have a quality beard or mustache comb handy, as well. As we shall see, a comb is a helpful tool to have for all stages of trimming. It’s always a good idea to trim while you’re in front of a mirror, such as your bathroom mirror, and to have good lighting. Make sure to check the overall length of your beard and mustache before you start to trim, and this is when having a comb is handy. Comb your whiskers up and then down to give you an idea of both your beard and mustache’s length, while also noticing the varying lengths and thickness of your facial hair. There’s some debate as to where you should begin trimming your beard first – some say the sides, others say from the chin. One reason to begin at your chin is that it’s the area where hair is longest and helps to serve as a guide for the rest of your face. So, make your first cuts at the chin and use those cuts to determine the length of the rest of your whiskers. 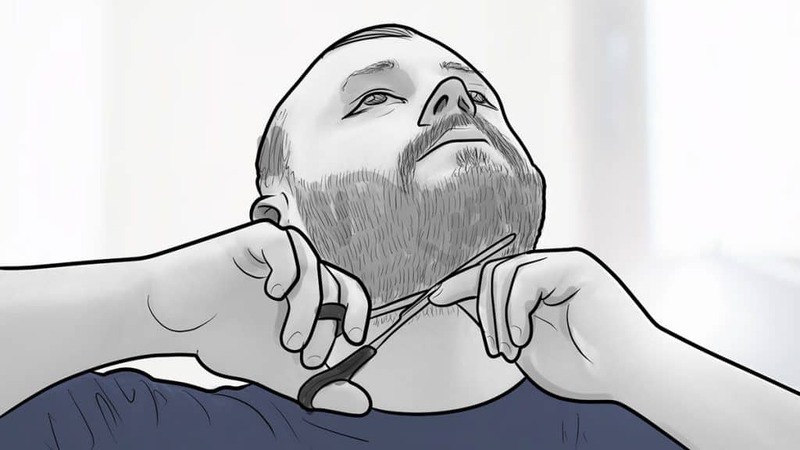 Trimming the underside of the chin can be tricky but you’ll make the task easier by first combing upward and then angling it to cut only the tips of your facial hair. An important point to keep in mind at the start and throughout the trimming process is that you want to avoid over-cutting. It’s best to trim the tips at first, while working in one section at a time, and only cutting more if needed. Remember, you can’t put back what you cut in excess. Use your beard/mustache comb, which you hold at a slight angle, as a guide. Then trim only the whiskers protruding from the teeth of the comb. 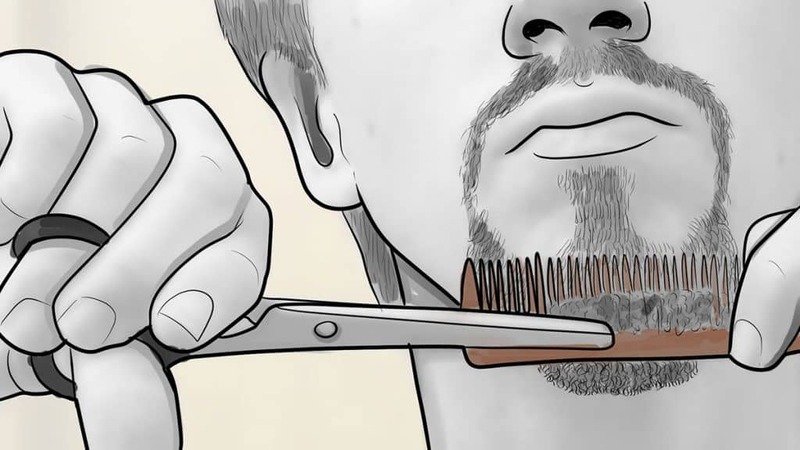 Keep the comb close to the surface of your facial hair to ensure that you’re not cutting too much hair. Once you’ve trimmed your chin, move up to the jawline while continuing to trim in the same way (while using a comb as a guide and being careful not to cut too much). Continue to comb your whiskers – on all parts of your face – and then angling the comb to cut just tips of the hair. While you want to take the time and care to get the neatest trim possible with your scissors, don’t focus on one area of the face over the others unless that area is particularly unruly. The goal is to have your beard flow evenly from one section to the next. It’s important to get a neat trim, while creating the right symmetry, when trimming your beard and mustache but don’t forget about your neck area. A sloppy-looking, untrimmed neck detracts from your overall look, so pay particular attention to the space underneath your chin while making sure that you don’t cut it too close to the skin. The same rule applies to the hair at the top part of your neck. You’ll need the same tools for trimming your mustache as you do for trimming your beard: scissors, a beard/mustache comb, and a mirror, as well as a well-lit room. Also, make sure your mustache is clean and dry; trimming a wet mustache is like trimming a wet beard, i.e., it’s going to appear shorter once it’s dried. Comb through your mustache until you know the true length of your whiskers. Combing also helps straighten your mustache hair so it’s easier to trim. Holding your scissors parallel to your lips, make small cuts along your lip line. Most men find it easier to begin trimming at the tips of the mustache and working toward the center of your upper lip. Once you reach the center on one side, trim the other side while also starting at the outer edge of your mustache. Create a clean line while trimming the top of your mustache. You may want to trim it at a 45-degree angle towards your lips to create a fuller look. But how you shape the top of your mustache is a matter of personal preference. Also, make sure to trim the area where your mustache meets your nose. The last thing you want is for the top of your mustache to look like long nose hair. To reduce the volume of your mustache, comb your whiskers up and away from your ‘stache so the ends of hair extend past the comb’s teeth. Again, trim a little at a time – you can always trim more but you can’t replace what you’ve already trimmed. Once you’re satisfied that you achieved the right length and fullness, comb your mustache one final time to see if you’ve missed any loose hairs. You should trim your mustache once a week, or more if needed. It’s always a good idea to wash or rinse your beard and mustache after trimming it to get rid of loose hairs that remain on your whiskers. There’s more than one way to trim a beard and mustache, and scissors and trimmers represent the primary options. Which method you choose comes down to personal preference as well as how comfortable you are with using each tool. First, what’s the difference between mustache scissors and beard scissors? The short answer to this question is that there isn’t a difference. Labeling aside, i.e., some scissors have mustache scissors in their name, others beard scissors, and most a combination of both, you can use facial hair scissors for your beard, mustache, eyebrows, even your nose hair. True, trimming your beard and trimming your mustache sometimes require different techniques. You can use the same tool for both jobs, however. There are many reasons why you should keep your beard and mustache neat and tidy, not the least of which is overall appearance. Even if you’re going for the wild, lumberjack look, you should give your beard the occasional trim to get rid of split ends that inhibit healthy growth. Beards with split ends become unruly, wiry, and coarse, while a well-trimmed beard looks fuller and healthier. Among the reasons in favor of trimming your mustache is that it keeps overgrown hair from intruding in your mouth. That’s not a good look, unless your preferred style is, say, the walrus mustache. Besides, hair intruding over your lips can easily become an additional napkin for stray food particles. We could go on and on about the importance of trimming your beard and mustache but we think you get the picture (and knew it already). Instead, let’s focus on the differences between using beard and mustache scissors and using a beard trimmer. An important characteristic of facial hair scissors is their size. They’re smaller than regular scissors – which you should never use to trim your beard or mustache – and are sharp, often extremely so, tools designed for trimming and shaping facial hair. 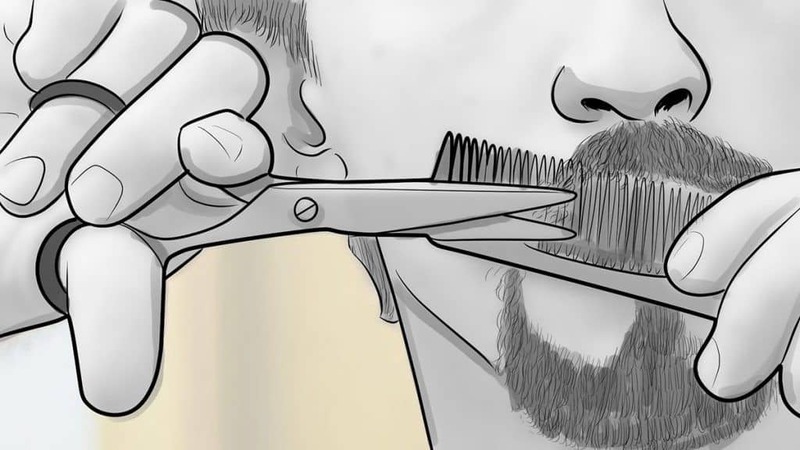 While using regular scissors for trimming your beard or ‘stache raises the risk of snipping off more hair than you intended, as well as increasing the likelihood of cutting or nicking your skin, beard scissors offer a more precise alternative. Beard and mustache scissors are shorter than regular scissors, which also allows you to reach hard-to-access areas of your face with greater ease. The chance of chopping off too much beard or mustache hair is lower with scissors. They’re smaller for one, and usually easier to control. That’s not to say screw-ups can’t happen, because they can, and using scissors still requires caution and patience. It’s easier to take off as much or as little length off your whiskers with scissors than with other trimming devices. You can use scissors to target split ends that grow horizontally from your face, but without taking as much length off your beard or mustache. Scissors are a good option for facial hair newbies just getting used to the task of trimming. You can start small and take your time – which lessens the chance of making a big mistake. Trimming with scissors takes longer than trimming with an electric or battery-powered trimmer. If you’re willing to take the time, however, you’ll love the clean and neat trim that scissors provide. There’s no question that a good beard trimmer is a workhorse that can handle just about everything you throw at it, including a thick, unruly beard that would make a caveman proud. You can use it to shape your beard, as well as to define your cheek, neck, and jawline, but the ability to trim in bulk is one of a trimmer’s strengths. It’s also hard to beat the speed of trimmers. You can take off a lot of hair at once thanks to the powerful motors that drive trimmers, and that’s handy for any man who finds himself crunched for time in the morning. The downside is that you can take off too much hair if you’re not careful or take the wrong angle as you trim. On the other hand, some men feel more secure when using a trimmer than a sharp pair of beard and mustache scissors. But for touch up jobs scissors typically work better than a trimmer. Trimmers are also helpful for achieving certain styles, such as a beard fade (or the countless other ways to style a beard). You can even use them to taper your sideburns. They’re also great for trimming shorter styles, such as stubble; just make sure to choose the correct razor guard that fits your needs. Beard trimmers come in a variety of styles that often include a myriad of useful gadgets that allow you to trim your beard to a set length and more. Trimmers also come in cordless and corded options. Cordless trimmers provide better mobility and eliminate the need to tap dance around a power cord as you trim your way-cool whiskers. Make sure you check a cordless trimmer’s battery runtime before you buy, however. We limited our list of best scissors to five but easily could have added several more because there are many quality products available. Narrowing it to five took into account many factors, not the least of which were the reviews of customers and experts alike. We also looked at overall quality, including how easy they were to use and how comfortably they fit into the hand. As always, we close out our product review while asking for your feedback and suggestions. Which beard and mustache scissors do you use? Have you tried any of the scissors on our list? Do you prefer scissors or beard trimmers?